Both Esher and Loughborough Students secured welcome victories in Round 20 of National One as they were able to distance themselves from the bottom three in the division. Esher sealed a crucial win against relegation threated Hull Ionians whilst the Students beat an in-form Rosslyn Park in the Midlands. The other two sides in the drop zone – Old Albanian and Fylde – both suffered defeats against Darlington Mowden Park and Amphtill & District, respectively. At the right end of the table, Coventry remain 15 points clear at the top following a professional performance against Bishop’s Stortford, while Cambridge edged out Plymouth Albion, Blackheath returned to winning ways against Birmingham Moseley and Caldy came from behind to beat Old Elthamians. Coventry produced a solid display against Bishop’s Stortford to maintain their 15-point lead at the top of National One. Max Trimble put the visitors ahead at Silver Leys and despite George Cullen landing a penalty for Stortford, Rob Knox, James Stokes and Trimble again went over for Cov. In the second-half, Nile Dacres and Scott Tolmie both scored to make sure of Coventry’s convincing win before Matt Tomlinson grabbed a consolation try for the hosts. Darlington Mowden Park beat Old Albanian to continue their 100 per cent record at home this season and they claimed a bonus point to keep league leaders Coventry in their sights. An early contender for @nca_rugby try of the week?? Matt Dudman, Callum Mackenzie and Brett Connon scored braces while Alfie Barron and Ben Frankland also went over. Old Albanian also bagged what could be a crucial bonus point in their fight for survival with tries by Ross Hamilton, Matthew Deane, Joe Bridger and Morgan Thompson. Ampthill and District extended their unbeaten run to six matches in National One following a professional performance against Fylde in Lancashire. The A’s, who currently sit third in the division, led 21-0 at the break thanks to tries from Josh Sharp, Joe Berics and Sam Baker. Syd Blackmore ultimately wrapped up the game with a bonus-point try before Fylde got themselves on the board following Ben Gregory’s score six minutes from the end. Cambridge delivered an impressive display as they edged out fourth placed Plymouth Albion at Volac Park. Tries from Matt Shepherd and Dean Squire put Plymouth 14-10 up at half-time, with Rob Conquest and the boot of Ben Penfold replying for the hosts. Jack Green’s penalty cut Albion’s lead to just a point before he landed a second kick which was enough to clinch victory for the Blood and Sand. Blackheath recovered from their loss against Hull Ionians to see off Birmingham Moseley in a tightly contested game at Well Hall. Club, who became the first side to beat league leaders Coventry in their last home outing, held an eight-point interval advantage thanks to a try from flanker Harry Bate and a penalty from Leo Fielding. Both sides exchanged scores after the restart as Fielding’s effort was matched by Mark Harrison’s try but a second for Fielding put the result beyond doubt. Moseley did have the final say on proceedings when Ciaran Moore crossed, but this was an excellent response by James Shanahan’s men. Caldy overturned a 14-point deficit to come out on top against Old Elthamians at Paton Field. The visitors moved ahead early in the match and led 21-7 thanks to tries from Tom White, Hamish Barton and James Golledge. Tom Banks had opened the scoring for the hosts, but Rhys Hayes’ try just before the break was the catalyst for Caldy’s fightback. Joe Carlisle extended OEs lead to 12-points shortly after the interval, but tries from Tom Sanders and Jack Collister turned the game on its head as Caldy moved two points in front. 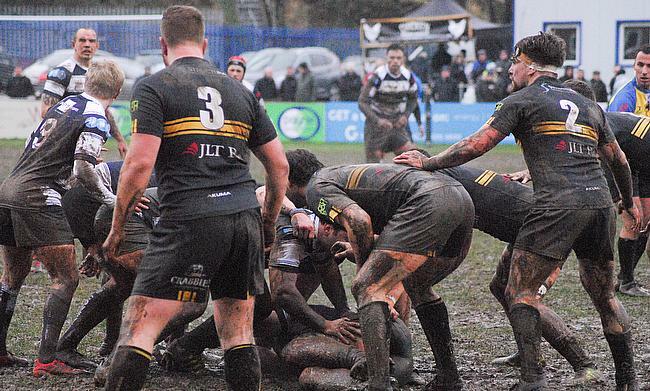 Hayes then landed a drop-goal before a late penalty confirmed the points for the home side. Oskar Hirskyji-Douglas scored twice as Loughborough Students picked up a welcome victory against Rosslyn Park in the Midlands. Penalties from Owen Waters and a score from Sam Ripper-Smith put the Students ahead, but tries from Henry Robinson and Harry Leonard gave Rosslyn Park a 15-13 lead at the break. However, that was as good as it got for the visitors as Hirskyji-Douglas’ brace before the hour swung the game firmly in Loughborough’s favour before another Waters kick and a George De Cothi score sealed the victory. A strong first-half performance by Esher secured a thrilling victory over Hull Ionians to move them 10 points clear of the relegation places. The I’s, who missed the opportunity to move out of the bottom three, trailed to Tom James’ early score. The hosts then dominated and led 26-10 at the interval thanks to tries by Ben Loader and Charlie Gossington, while James Newman crossed for Hull. Both sides swapped tries after the break with Sam Rees’ score being cancelled out by Esher’s Stephen Boatman before Hugo Seccombe’s effort ultimately secured the win for the home side. James Sanderson and Rees both crossed late on to earn the I’s a bonus-point, but they are now four points from safety heading into February.